I've been playing with silly perl scripts again. This one produces a graph of the distribution of entries in current_mood. It uses a local copy of Evan's logjam moods file, as getevents only returns current_moodid. 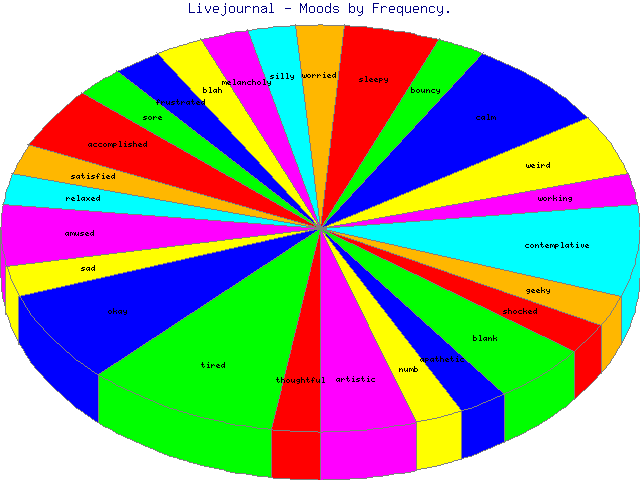 After retrieving all journal entries and building hashes of moodid=>mood and moodid=>frequency, it plots a pie chart using GD::Graph::pie. a moods file, which would need to go into the same directory as the script if you want to run it..